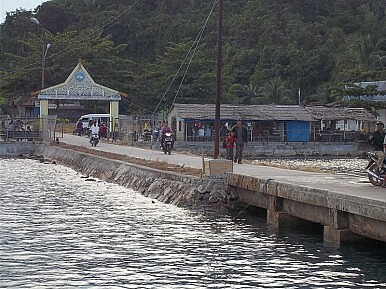 Serasan Harbor, Natuna Islands, Riau Islands Province, Indonesia. Bold action by a Chinese coast guard vessel to retrieve a fishing vessel has led to a major incident between Jakarta and Beijing. Tensions spiked in the South China Sea on Sunday due to an incident involving a Chinese fishing boat in the Natuna Sea, near Indonesia’s Natuna Islands. According to the Jakarta Post, Chinese coast guard vessels “forcibly rescued” a Chinese fishing boat, the Kway Fey 10078, after it had been interdicted and captured by Indonesia’s Maritime and Fisheries Monitoring Task Force. The vessel was pursued by Indonesian authorities because it was fishing illegally near the Natuna Islands. According to Indonesia’s Minister of Fisheries and Maritime Affairs Susi Pudjiastuti, Kway Fey 10078 was within 4.34 kilometers off one of the Natuna Islands, but it remains ambiguous if this is where the vessel was initially spotted fishing by Indonesia authorities or if this was the location of the Chinese coast guard’s so-called forcible rescue. “We will summon the Chinese ambassador to discuss the issue. Because in the process of capturing the ship, a standoff occurred,” Susitold the press on Sunday. “We respect China, but we must also maintain our sovereignty,” she added. “We want to avoid a much more serious incident, so we settled on just arresting the eight crew members. The ship got away but we have the eight men in custody to help us investigate this incident,” Susi clarified. In a statement to Reuters, the Chinese foreign ministry noted that the fishing vessel was engaged in “normal activities” in “traditional Chinese fishing grounds,” raising concerns that China may be asserting maritime claims to waters in the Natuna Sea. Indonesia has summoned the Chinese ambassador in Jakarta over the incident. Though Indonesia is not a claimant in the South China Sea disputes that involve scores of features, Jakarta has been wary over possible Chinese claims to waters around Natuna, which sits just at the southern reach of China’s ambiguously defined nine-dashed line claim in the South China Sea. Indonesia has been careful diplomatically in seeking clarification from China regarding the nature of its claims near the Natuna Islands; Jakarta is wary of formally recognizing that a dispute exists, thereby potentially legitimizing China’s position. The incident began on Saturday at 2 p.m. when Indonesian authorities spotted the Chinese vessel Kway Fey 10078, of 200 gross tons, at the position 05°05’866” N/109°07’646” E, within Indonesia’s exclusive economic zone (EEZ) in the South China Sea. At 3 p.m., the Maritime Affairs and Fisheries Ministry patrol vessel KP HIU 011 detained the vessel along with eight crew members, on the grounds of illegal fishing using trawl nets, and escorted the ship to Natuna waters for further investigation. At 2 a.m. on Sunday, on the way to Natuna, an armed Chinese coast guard ship collided with the towed ship in an apparent attempt to shut down its engine to prevent it being taken to Indonesian territorial waters. Soon after, another better-equipped Chinese coast guard ship arrived on the scene and ordered the Indonesian patrol vessel to release the ship within 30 minutes in order that it could be taken back to Chinese waters. This chronology suggests an unprecedented level of Chinese coast guard aggression against Indonesian maritime patrol vessels. (Similar incidents occurred in 2010 and 2013, but none within a proximity to Indonesian territory similar to this incident.) Chinese coast guard vessels have had similar encounters with Vietnamese and Filipino vessels in the past, but both Hanoi and Manila are claimants to features that China also claims in the Paracels and Spratly Islands. In 2014, China presented new maps of its nine-dashed line claim that included waters in the Natuna Sea, starting the current period of concern in Jakarta. “China has claimed Natuna waters as their territorial waters,” a senior Indonesian defense official had remarked at the time. In September 2015, as my colleague Prashanth Parameswaran reported, Indonesia moved to bolster its defense near the Natuna Islands. “We are not in a war situation, but the South China Sea is very close to us,” Indonesian Defense Minister Ryamizard Ryacudu said at the time. The Indonesian government under Joko “Jokowi” Widodo has taken a particular interest in safeguarding Indonesia’s maritime sovereignty and security. In the broader context of the South China Sea disputes between China and Southeast Asian claimant states, it’s notable that this encounter occurred within two weeks of a similarly bold move by Chinese coast guard vessels at Jackson Atoll, a popular fishing ground for Filipino fishermen in the Spratly Islands. Though two incidents don’t suggest a pattern, with the upcoming international arbitration decision in Philippines v. China at the Permanent Court of Arbitration in the Hague, China may be looking stake out its claims. Among other issues, that arbitration ruling will likely decide if China’s nine-dashed line claim is compliant with international law, specifically UNCLOS.